My kids usually walk to school (What a blessing that is!) but with Brit's broken foot I drove them this morning. Something about her walking on crutches on a snow and ice covered sidewalk downhill and then uphill has made the kinder, gentler mother side in me come out. This morning there was the usual line of cars waiting to turn into the parking lot and pull through the Kiss-and-Go lane in front of the school. Everyone is always very civil about it, and although it takes a bit, it really isn't that bad. From the street out front there was the line to turn right into the school drive, and then I was in the line coming from the opposite direction, so I was waiting to turn left. This means I needed to wait for a break in the line that's turning right, make sure the drivers pulling out of the school drive are going to stop for me, and make sure there is no one coming straight through, because they have the right-of-way. Everyone is so nice and lets everyone else in and it's all very orderly. Well, there was a woman in the opposite line turning right into the parking lot (so she had the right-of-way), and she stops to let me in. This was very nice of her, but there was a car coming straight that also had the right-of-way. They weren't going to stop, so I couldn't go. But she couldn't see them since they were coming up from behind her, so she's nicely motioning for me to go in front of her. But I couldn't go! Then she makes a stern face and waves even harder for me to go, but the other car was still coming so I couldn't go! Then she glares at me and jabs her hand in the direction of the drive, but my motion to her that there was a car coming probably just looked like I was pointing at her. So she throws her hands in the air, rolls her eyes, shakes her head and pulls her car into the drive. The car going straight passes me, I wait a couple more cars, and then pull into the drive when the next person pauses to let me go. It sounds confusing written out like this, and the whole incident only took a few seconds in real time, but it kind of made me stop and think. I was frustrated at first with the woman because she was frustrated with me for not going, but I couldn't go because of the other car! Then it made me laugh because she couldn't see the other car! She was just trying to be helpful to me, and instead wound up exasperated because it seemed to her like I was being difficult and not accepting her help. But she couldn't see the bigger picture! Then I wondered how many times in life have I done this to someone else? Meaning well, I try to help the other person. But, I can't see the whole picture. I can't see what's coming. But they can. So, they don't take my help, and I wind up exasperated with them thinking, "Fine! Ignore my gesture of goodwill! Whatever!" When, really, if they accepted my help they would wind up in a much worse situation. If I would have pulled forward just because the woman was motioning me to, I could have caused a serious accident! But she couldn't see that at all! Had she known, she would have never motioned for me to go. It was just a good reminder that sometimes we don't see the bigger picture, but maybe someone else does. Maybe not all the time, but it does happen. Instead of taking it personally, we can choose to change our perspective and simply know that we're offering what we can offer, but not get hurt or offended when someone else doesn't take us up on it. It doesn't mean we should stop offering. It doesn't mean that woman should never stop again to let anyone in the line. It just means that maybe it wasn't the right timing for that person. We don't always see the bigger picture, but God does. not to get offended when someone doesn't take us up on it. Anyway, a longer than needed story to communicate a thought I had this morning while sitting in the Kiss-and-Go line at the kids' school. 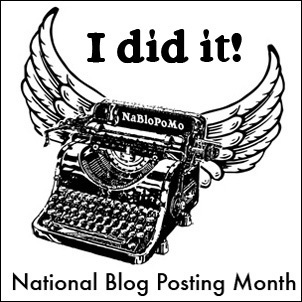 And, just so it is brought to the attention of anyone who has been keeping record, today is the last day of NaBloPoMo. I blogged every. freaking. day. in the month of November. And one day I even blogged twice! And, whereas at the start of the month I was singing Whitesnake's Hear I Go Again, I am ending this month by singing (What else?) Queen's We Are The Champions.